At CORE Kids Academy, we pull out all the stops (and equipment!) to make your child’s birthday bash a blast. Our coaches lead an action packed hour and half of activities and take care of it all--from set up to clean up and even loading your car-allowing you to kick back and enjoy your child's special day! Private use of the entire CORE Kids Academy facility for 90 minutes—starting with 60 minutes of gymnastics led by two energetic coaches and then 30 minutes in our party room. Age-appropriate circuits that incorporate all of our equipment, including the 30-foot inflatable caterpillar obstacle course, 4 in-ground trampolines, tumbletrak, and MUCH more! *For children 6 and under. Flying birthday children older than 6 is up to the discretion of the party instructor. Paper products including plates, napkins, and utensils-- post-party cleanup is covered, too. Cups are not included. Do you offer parties on weekdays? Available days and times for a weekday party during the school year are extremely limited due to the high volume of classes we host during the week. Availability for a weekday party depends on the time of year, and is always subject to change. Call us at (804)740-0079 to find out more. How much does a party at CORE cost? For current members (current on yearly registration dues) our party price is $265, while our non-member price is $295. A NON-REFUNDABLE $100 deposit is required to reserve your party date, and will be deducted from your final balance on the day of your party. How many children can attend a party at CORE? 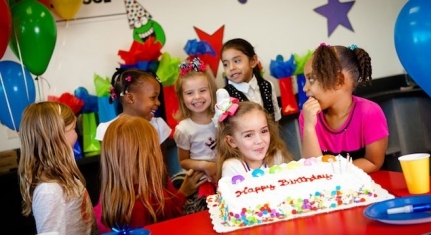 The party price includes fun for up to 15 children including the birthday child. Additional guests can be accommodated for $15 per child. Do you offer joint parties/extra time/etc.? *Flying all party participants is up to the discretion of the party instructor. Party participants must be age 6 and under to fly. *Please note that since we do back-to-back parties, extra time is subject to availability. Children under the age of 3 will need to be supervised at ALL TIMES by an adult while in the gym. If a child needs help in the restroom, it is the responsibility of either the child’s parent or the party parent. Please inform all party guests that they will be barefoot while on the gym floor and need to wear comfortable clothes for moving around!